What is up with people making public betas and then insisting that they be kept top-secret? I decided to download the ReSharper 4.0 beta, so I could finally get some ReSharpery goodness in Visual Studio 2008. Then I read their license agreement, and it’s almost as bad as the public embarrassment that was the Delphi 2005 beta license. You’d think someone posting a public beta would want advance publicity and grassroots buzz, but I guess not. Read that a few times. It says that anything I could possibly have to say about the beta (“reports or other information”), whether I send it to JetBrains or not (“made or provided”), is not mine. Which means I would be in violation of copyright (by illegally copying JetBrains’ intellectual property) if I posted anything on my blog about the beta. [“Confidential Information” means] … (iii) the terms, conditions, and existence of this Agreement. They were, in fact, smart enough to only make me promise to keep the beta top-secret (along with any other pre-release software they may make public over the next five years). I can still talk about released versions. Whew! They’re also nice enough to say that I don’t have to disavow knowledge that was already publicly available. Again, a step up from Delphi. But still a disappointment. Anyway, don’t expect me to help hype their public beta. I wish I could; it looks like it’ll have loads of cool stuff in it. But they don’t want my hype; they want their public beta kept secret… so I will be contractually obligated to disavow this blog post, starting about two minutes from now. Binary DFMs are a pain, because you can’t see what changed between two versions. Right? That’s what we thought. We’ve been avoiding binary DFMs since time immemorial, especially back in the Dark Ages when we used VSS, which won’t even keep revision history for binary files. Even now that we’re on Subversion — which has no problem with binary files, thank you — we still avoid binary DFMs. Among other things, it’s hard to write a Ruby script to grep through a directory of binary DFMs. And, of course, they’re hard to diff. Or so I thought. So imagine my surprise yesterday when I was writing a Ruby script to grep through our code and DFMs, and it dumped out some gibberish and beeped a couple of times. I looked, and sure enough, we had a binary DFM. It wasn’t even some fringe GUI that we had written once and never modified — we had, in fact, made several changes to the DFM in the past year. This really puzzled me. Did this file get accidentally changed to binary format recently? But we should’ve noticed when we checked in. We shouldn’t ever check in without looking at the diffs first. And of course you can’t diff a binary DFM, right? But I looked at the file history. That file had been in our repository for years, binary all the way. It had been modified several times. Surely people had tried to look at the diffs. So what happened? We’ve been happy users of the superb Beyond Compare diff tool for almost three years, and have made it our default diff viewer for TortoiseSVN. Beyond Compare is written in Delphi. Yep. Of course Beyond Compare, as a Delphi app, has some Delphi-isms built in. It’s so cool that it can diff binary DFMs, and make them look just like text in the diff viewer. Internally, I’m sure they call Classes.ObjectBinaryToText (handy thing about writing a tool in Delphi that works with Delphi code, you get the library functions for free), so as far as you can tell when you’re looking at diffs, the file looks like it’s been a text DFM all along. My only gripe is that it does this utterly silently. There’s no indication that this is a binary DFM that it converted to text for your convenience. And since binary DFMs are inconvenient in other ways (e.g., Trac can’t show diffs on them), I’d rather not have any binary DFMs in our code base at all. So in some ways, I’d almost rather not have this feature — I’d notice the binary DFMs a lot sooner if they looked like garbage in the diff window. Then again, when I re-saved the DFM as text, it was sure nice to have those diffs to show that nothing important had changed. Binary DFM on the left, text DFM on the right, and the handful of changes highlighted just as nice as you please. I’m often curious about whether an app I’m using was written in Delphi. Here’s an easy way to tell, that works most of the time. If a Delphi app does use Delphi 2007’s MainFormOnTaskbar, then it will have the normal window menu, so a normal menu doesn’t necessarily mean it wasn’t written in Delphi. 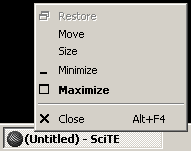 But if you right-click the taskbar button and do see only Restore, Minimize, and Close, it’s a pretty sure thing that it’s a Delphi app. Tyler version 0.01 is now available for download. Currently there’s just a source distribution, but it includes compiled EXEs. The ZIP download is no longer available, but you can check the code out of the Subversion repository: version 0.01 or latest code. Pluggable display libraries. You can select from “compatibility mode” (basic GDI via TCanvas), Asphyre eXtreme, and (un)DelphiX (but see note 1 below). Windowed mode only — no fullscreen support in this version. Movement. You can use the cursor keys to move the hero around the map. There’s nothing yet to make you stop when you run into a wall or the NPC, though. Currently you can only have one map. Later you’ll be able to have lots of them — a world map, a map for each town, a map for each dungeon level. Some stuff is hard-coded in this version, like the initial position of the hero, and the position and movement of the NPC. This will be improved in the next few versions. Note 1: The license agreement for (un)DelphiX does not allow me to redistribute its source code. So, the source distribution is (un)DelphiX-less. But it still compiles: if you download and compile the source distribution, (un)DelphiX support will be automatically disabled. To enable (un)DelphiX, see the notes in the vendor\undelphix directory. Note 2: The map file format will change in future versions. Any maps you create in this version probably will not work in v0.02 and later. The next few releases will be working toward a major milestone: a finished game. Not a long game — it’ll probably take less than a minute to play from start to finish. And not a very exciting one. In fact, it’ll be pretty stupid. But it’ll be playable, and everything will be editable in the game editor. Stay tuned for more news of… Stupid Quest.